Drives frequent positive interaction with customers. Provides native integration to SuiteCommerce Advanced, SuiteCommerce Site Builder, NetSuite ERP and NetSuite SCIS Module (POS). Does not require integration with any other external system. Creates positive customer experiences that demonstrate your appreciation with rewards that are easy to redeem and a system that’s fun to use. Increases revenue by driving greater frequency of customer engagement and lasting relationships. Reduces your advertising costs while increasing the effectiveness of your promotions and motivating customer behaviors. Increases customer referrals and recommendations with programs like Refer-A-Friend, Initial Sign-up Bonus Points, E-mail share and others. Configures and defines award points for various customer activities with ease. Provides customers the ability to view their loyalty point balances from their smartphones – always updated in real-time. Allows customers to redeem loyalty points online through gift certificates. Generates email alerts when a redemption occurs and provides balanced notifications on fixed intervals. Offers flexibility to accommodate your unique business needs. Provides integration with Facebook Share, Facebook Like, Google Plus Share, Email Share and others. Allows special programs including: Refer A Friend, Birthday and Anniversary Points, Award for Product Reviews, Initial Sign-up Bonus Points and more. 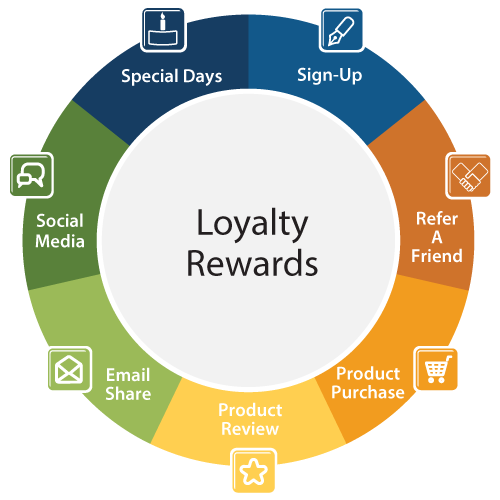 Integrates with SCIS providing visibility to customer loyalty points and balances for your sales team. Provides custom points on different items to your customers.